As a dividend growth investor my modus operandi typically revolves around buying shares of high quality companies that I deem undervalued. Those companies typically have long histories of growing the dividend payment to shareholders which is what dividend growth investing is all about. By running this blog that chronicles my investments and my journey to financial independence I always want to be open and honest with any changes to my portfolio. After all, if I'm not willing to follow my own advice why should you follow my story? Occasionally though it comes time to sell some shares and close a position. Sometimes that decision is due to valuation, concerns about the company or just portfolio allocation. There haven't been too many sales within my portfolio and just glancing at the post labels gives you a hint of the relationship. There's over 130 Recent Buy articles, but this is only the 11th Recent Sell article. So, it's pretty obvious that I prefer to make purchases, but sometimes there's other factors at play and a sale is necessary. Let's look at the transactions and returns first and then I'll discuss the reasoning behind the sale. On Wednesday, October 5th I made the decision to sell 22 shares of my 82.506 share position in Harris Corporation). I sold the 22 shares for $91.782 per share which netted me $2,011.20 after commission and fees. I'm going to look at the returns a little differently than normal since I only trimmed the position rather than close it completely. All 22 shares that were sold were purchased in August 2012 at a total cost basis of $1,039.47. Yep, that's right a 93.5% return in just over 4 years from Harris and an equally impressive 17.5% compound annual growth rate. Not bad if I do say so myself considering that doesn't even account for the dividends received on those shares which just boosts up the returns even higher. 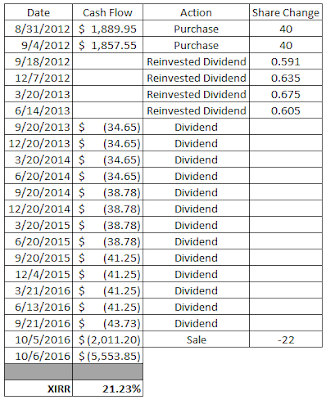 I still own over 60 shares of Harris Corporation so let's take a gander at what the returns looks like including the dividend payments. Returns are through the closing price on October 5th and account for all purchases, sales, reinvested dividends and cash dividends. Yeah, you could say I'm pretty pleased with the results. I don't think anyone would complain about 21% internal rates of return over a 4 year period. If only I could find a way to do that with every investment I make. So why try and fix what isn't broke? That's a good question especially when you consider the fact that Harris is a Dividend Contender with 15 consecutive years of dividend growth, announced another dividend raise in late August and cumulatively have rewarded me with over 43% dividend growth on the first shares that I purchased. So the decision wasn't made lightly. Typically whenever I consider selling shares of a wonderful company it's largely based on my perceived disconnect between the share price and value of the shares. It's the same as when I purchase, but in reverse because it always comes down to that relationship. 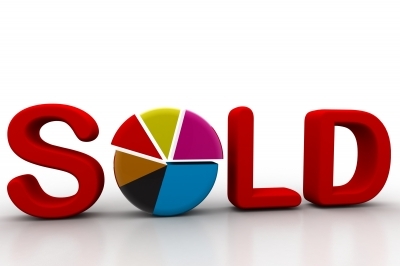 However, I've always found that selling assets is always much harder than making the purchase. The valuation isn't really out of line with what shares have historically traded for with just about every relative valuation metric, except for TTM P/E, being in line with the historical norms. Free cash flow generation is still really strong with over $6.88 per share generated in FY 2016. My decision to sell was largely based on other factors. One being my concern about the valuations with the market as a whole. I have no clue when the tide will turn but the bull run is definitely long in the tooth and even more so when you consider that most companies are finding it hard to generate real growth. Whenever fear takes over the markets the selling becomes indiscriminate with great companies being sold along with the markets. The other reason that I trimmed my position back is that because of Harris' excellent run my position size has essentially doubled. Prior to trimming back my shares Harris accounted for just over 4% of my FI Portfolio which was a bit more than I'd like it to be at. Given my concerns with Harris' weighting, general uneasiness about the market and lack of cash on the sidelines I decided to book a profit and look for other opportunities. Unfortunately any time you sell shares that means you no longer get to receive dividends from the company. Harris' current yield is just slightly over 2.3% and losing these shares reduces my forward 12-month dividends by $46.64. That hurts but it's not the end of the world. Lucky for me though with a dividend yield that low it creates a very low hurdle in order to improve my forward dividends. Altria for one is now offering nearly a 4% yield and the growth prospects are fairly similar if Harris' recent 6.0% raise is any guide to the future. That would represent over a 70% improvement in my forward dividends. My FI Portfolio's forward 12-month dividends declined to $5,458.30. My Loyal3 Portfolio's dividends are still at $65.21 which brings my total taxable account forward dividends to $5,523.51. My Roth IRA's forward 12-month dividends stayed the same at $240.84. Do you own Harris Corporation? Have you trimmed a position for allocation reasons or do you typically just let it ride? What companies, if any, look like good investments at this time? Yeah the time felt right to book some of those profits especially considering I was sitting on more than a double when you factor in the dividends. I only trimmed about 1/4 of the position so I'm still riding the wave, but I think it's foolish to never book some profits. Great return, almost 100% in 4 years. I like the idea of trimming the position and locking in some gains. Do you have any stocks in mind that you want to put that money towards, or are you going to hold the cash for a while? There's no complaints on essentially a double in price in just over 4 years. I've already put this cash to work via puts but there's nothing that I'm particularly excited about to invest outright in. I'd rather keep my options open via cash or the options market. 94% in 4 years is awesome considering that's price appreciation alone. If only I could find a way to get 17% CAGR price appreciation on all my positions. Then I'd be set.